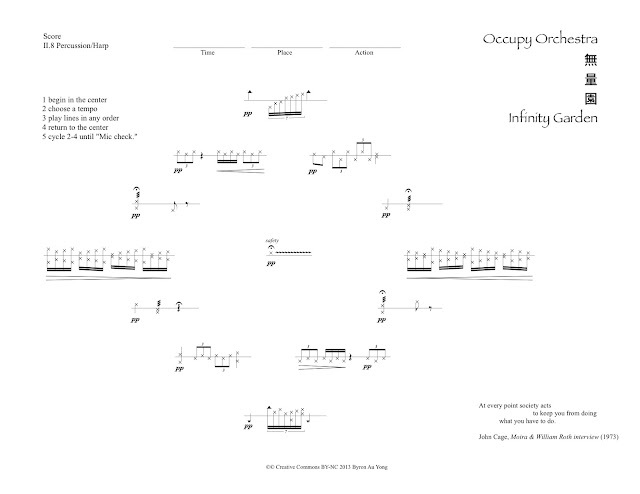 On the bottom right corner of every Occupy Orchestra 無量園 Infinity Garden page, find a quote from composer John Cage. I modeled the score to feel similar to Chinese landscape paintings that include calligraphy inscriptions. There are 17 Cage quotes + one Occupy Wall Street quote. Additionally, the score draws inspiration from huiwen shi (回文诗) palindrome poems. Su Hui (苏蕙), a poet from the 4th century, innovated this type of poetry. Characters can be read vertically, horizontally, forwards, backwards & diagonally. Especially significant is her Xuanji Tu (璇玑图) armillary-sphere map. 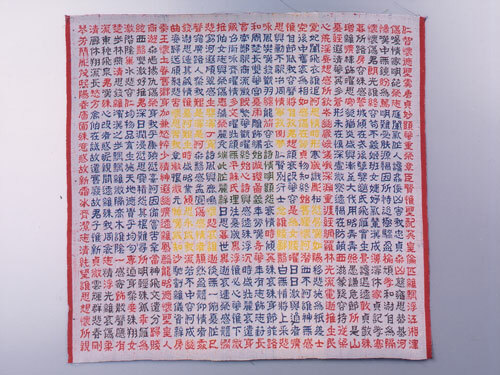 Using five colors of silk thread, she embroidered 841 Chinese characters into a 29 x 29 grid to create lines of poetry that can be read in any direction for a total of 2,848 poems. The Cage quotes on the score follow this idea adapted to English. The text is scattered to allow the eye to read non-linearly and savor the puzzle-like relationship between individual words. Cage opens up the space between words in some of his text such as Lecture on Nothing. I decided to open up all the text for the score. Below are the inscriptions included in Occupy Orchestra 無量園 Infinity Garden. See the score for the scattered text version. It is not irritating to be where one is . that comes to my attention. to give oneself up . and to go in the direction of the good. the nothing that supports us . to the very life we're living . you are where you are .